When you summon another creature, you gain 1 health. Bruma Profiteer is a rare Willpower creature card. It is part of the Core Set. In addition to the card's availability in the Core Set, two copies are included in the Ancano's Cunning theme deck, two copies in the Imperial Might deck, one copy in the Band of Survivors deck, and one copy in the Tribunal Glory theme deck. "There's a plan. There's always a plan." "You won't foil my plan!" "I'll profit from your death." "I have no patience for fools." 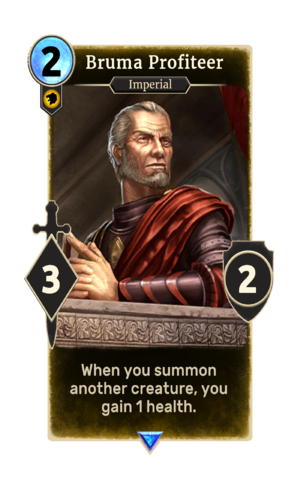 The card is named for the Cyrodiil city of Bruma, which first appeared in Oblivion and later reappeared in ESO. This page was last modified on 15 February 2019, at 11:48.